What is Fine Bubble Electrolyzed Water? 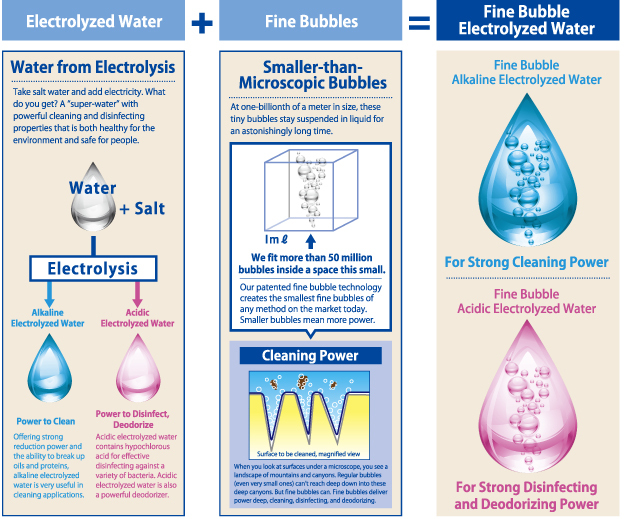 Alkaline electrolyzed water and fine bubbles team up for even greater reduction power, lifting oxidized matter away from surfaces to clean tough stains. With better penetration into microscopic cracks and crevices below the surface, fine bubble electrolyzed water goes deeper than ever possible before, pulling out stains, dirt, and bacteria. Fine bubbles drive electrolyzed water deep into the cleaning surface where normal water and detergents can't reach. That means greater disinfecting power and more reliable cleaning. One of the drawbacks of regular electrolyzed water is that is dissipates relatively quickly. By adding fine bubbles, we keep the effective components of electrolyzed water viable for much longer-even weeks long.